In 2011, Democrat Jerry Brown succeeded Republican Arnold Schwarzenegger as California’s governor, and California voters passed Proposition 25, which provided for state budget approval with a simple majority vote in the legislature as opposed to the prior two-thirds requirement. 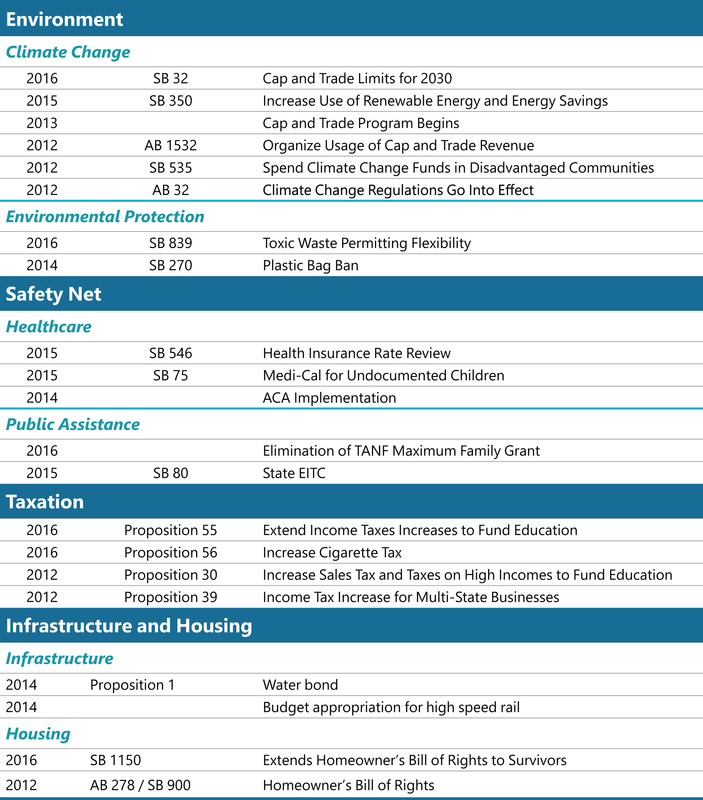 Already controlling both houses of the state legislature, the addition of the governorship and the simplified budget process allowed California Democrats to enact an activist economic policy agenda. Labeled “the California Policy Model” (CPM) here, this set of policies expanded the role of government in California’s economy by raising its minimum wage, extending health insurance to millions of residents, setting ambitious climate policy, and raising taxes on high earners and corporations. This report will briefly describe the components of the CPM, and then compare California’s performance on jobs and economic growth to states led by Republican-controlled governments. Then, it evaluates some of the larger pieces of the CPM to determine if the policies had their intended effects. Finally, it uses the synthetic control statistical method to ensure that the analysis makes an apples to apples comparison of California’s performance. The California Policy Model as defined here is a collection of 51 pieces of legislation and policy implementations enacted in California between 2011 and 2016 in the areas of workers’ rights, the safety net, the environment, taxation, and infrastructure and housing. Included in the CPM are minimum wage increases, the state’s implementation of the ACA, several policies related to climate change, and a large set of new protections for the state’s workforce. 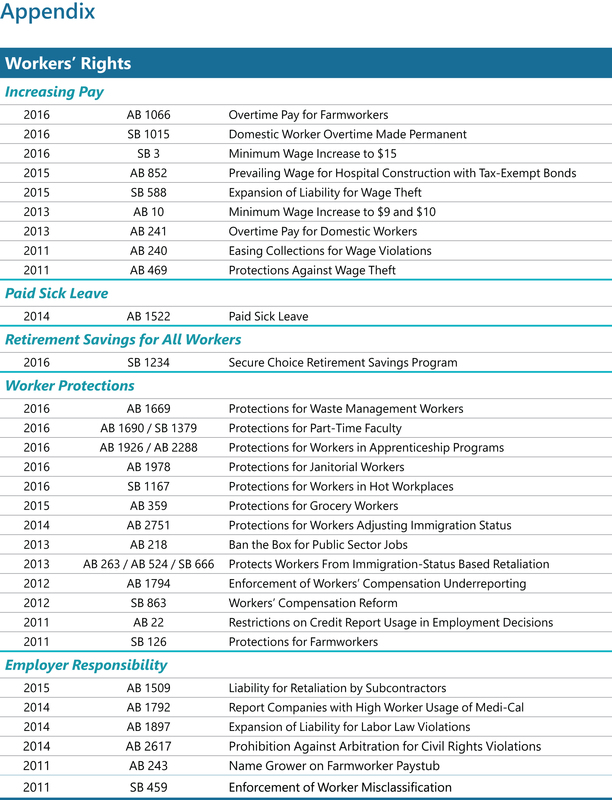 The policies were selected for inclusion in the CPM through a combination of conversations with participants and observers of California politics, and an examination of legislation prioritized by the California Labor Federation or opposed at some point as “job-killers” by the California Chamber of Commerce. Figure 1 shows the timeline of the CPM broken out by policy category. The sections below briefly describe the CPM policies in each category. The full list of CPM policies can be found in the Appendix. Note: Dots indicate individual policies, hover over dots to view them. The CPM contains a number of other policies intended to expand workers’ rights. Some, like the state’s efforts to combat wage theft, also increase pay. California mandated paid sick leave for all workers, and created a savings plan to promote retirement security for workers who do not have access to retirement savings plans through their job. The CPM also contains targeted worker protections that extend additional rights to workers in specific classes and industries, including a number of measures to protect workers from mistreatment on the basis of immigration status. In 2006, under Governor Schwarzenegger, California passed AB 32, which committed the state to lowering its greenhouse gas emissions to 1990 levels by 2020. In 2012 and 2013, as part of the California Policy Model under Governor Brown, the state enacted regulations implementing AB 32 that encouraged emissions reduction and started its cap and trade program. In 2015 and 2016, California passed SB 350, committing the state to greater use of renewable energy and further improvements in energy efficiency, and SB 32, which raised the emissions reduction goal to 40 percent below 1990 levels by 2030. In 2015, California further expanded its Medi-Cal program to include undocumented immigrant children, making an estimated 250,000 additional children eligible for coverage.12 California fully funds this coverage expansion as federal funds cannot be spent on undocumented residents. California has made major investments in public infrastructure. In 2014, the state allocated 25 percent of the revenue raised from its cap and trade program to the construction of its high-speed rail link between the San Francisco Bay Area and Los Angeles. During the 2014 election, California voters approved $7.5 billion in bond financing to improve the state’s water infrastructure. In 2012, California passed the Homeowner’s Bill of Rights, which provided California homeowners with expanded protections during the foreclosure process, and in 2016 it extended many of these rights to the survivors of deceased homeowners. How Did the California Policy Model Affect Jobs and the Economy? The first step in evaluating the effects of the California Policy Model is to compare California’s economic performance with the average economic performance of Republican-controlled states, meaning those in which Republicans held the governor’s office and control of the state legislature throughout the period of CPM implementation (2011 to 2016). Using this definition, the following 19 states were considered to be Republican controlled and thus were included in this analysis: Alabama, Arizona, Florida, Georgia, Idaho, Indiana, Kansas, Michigan, Nebraska, North Dakota, Ohio, Oklahoma, South Carolina, South Dakota, Tennessee, Texas, Utah, Wisconsin, and Wyoming. A primary critique of interventionist economic policies such as those included in the California Policy Model is that they will dampen employment. We test this notion by using two indicators to compare changes in employment from 2011 to 2016 in California with changes in Republican-controlled states. Total employment, the first indicator, includes both the public and private sectors and gives a picture of overall job growth. Private-sector employment is broken out and analyzed separately as the second indicator. Critics of interventionist policies believe that negative impacts could be more severe in the private sector than in the public sector, since businesses are less able to absorb potential costs created by market regulations and would therefore be more likely to reduce employment in response. Critics also argue that interventionist economic policies will have a negative effect on economic growth. To test this claim, we compare the growth of state GDP from 2011 to 2016 in California with that in the Republican-controlled states. 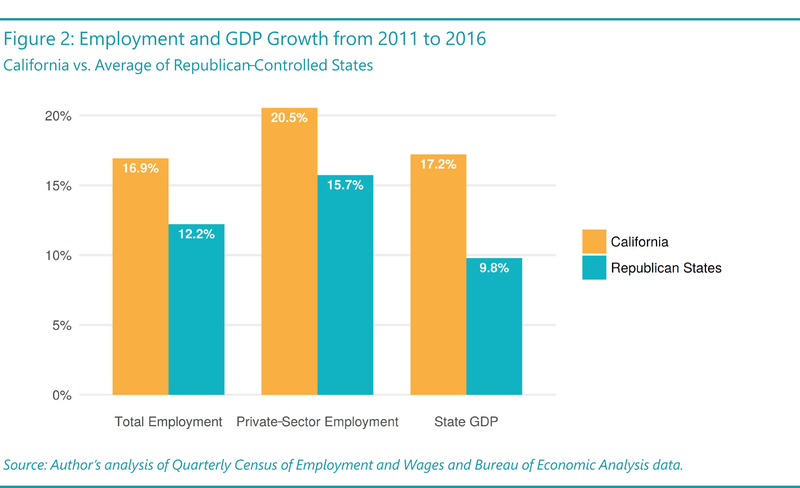 As seen in Figure 2, California has had greater employment growth, both overall and in the private sector, than the average of the Republican-controlled states. Total employment grew by 16.9 percent in California from 2011 to 2016 compared to an average of 12.2 percent in Republican-controlled states. In the private sector, California employment grew by 20.5 percent, while the average private-sector employment growth in Republican-controlled states was just 15.7 percent. Also shown in Figure 2, California has had stronger economic growth than the Republican states. Between 2011 and 2016, California’s GDP grew by 17.2 percent, whereas Republican states’ average growth was only 9.8 percent. Did the Policies Achieve their Goals? The analysis of employment and economic growth in California and Republican-controlled states shows no evidence whatsoever of “job killing” effects from the California Policy Model. We next turn to the question of whether the CPM policies achieved their intended effects. This section examines whether the CPM was successful in raising wages for low-wage workers, increasing the number of Californians with health insurance, reducing wage inequality, and curbing carbon emissions. 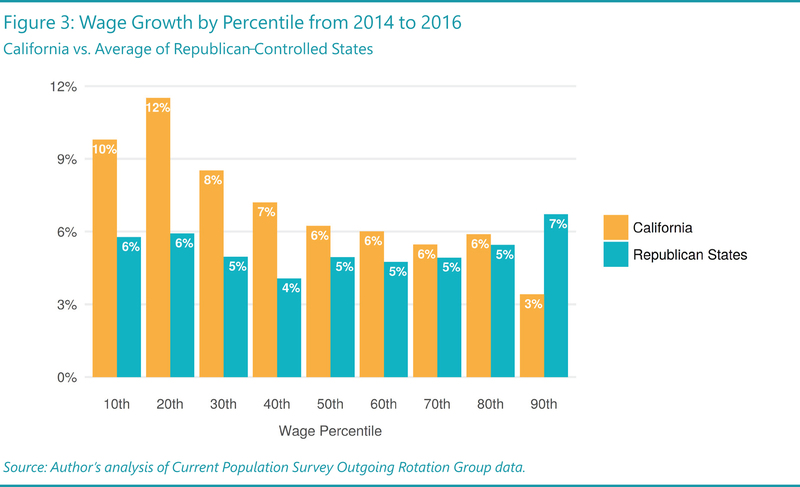 As Figure 3 shows, wage growth for low-wage workers from 2014 to 2016 in California outpaced that in Republican-controlled states. 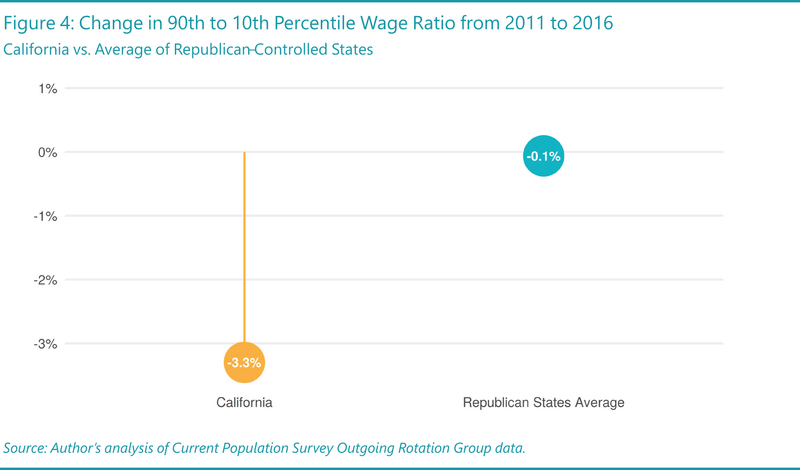 Wages at the 10th percentile of the wage distribution grew by 10 percent in California over this period compared to 6 percent on average in Republican states. At the 20th percentile, wages in California grew twice as fast as they did in Republican-controlled states (12 percent compared to 6 percent). Figure 3 also shows that, in California, wages at the 50th to 90th percentile grew by 3 to 6 percent, a lower growth rate than for low-wage workers and similar to the growth rate at all percentiles in Republican states, suggesting that the higher growth rates for low-wage workers in California are due to the state’s minimum wage increases. To the extent that the minimum wage increases drove an increase in wage growth for low-wage workers, they along with other policies in the CPM like tax increases on high-earners may have also helped mitigate the growth of wage inequality in California. Proponents of the CPM also argue that the policies will have this effect. Figure 4 shows that the wage ratio declined by 3.3 percentage points in California from 2011 to 2016, but hardly changed at all in Republican-controlled states (a 0.1 percentage point average decline). This suggests that the CPM was able to reduce wage inequality to some extent. Are Republican States the Correct Comparison Group? The analyses discussed above compare California to an average of Republican-controlled states on various economic and social indicators in order to evaluate the effects of the CPM. But this may not be an appropriate comparison. The Republican states may differ from California in ways that bring bias into the comparison. For example, the industries driving growth in California may be different than those in the Republican states, or California might have been in a different point in its economic cycle than the Republican states. In other words, California’s stronger economic performance, as detailed above, could stem from the particular characteristics of California’s economy, not the effects of the policies in the CPM. The ideal method to measure the effects of the CPM on California’s economic performance would be to compare the state to an alternate version of California that did not implement the CPM. Since the only difference between these two Californias would be the presence of the CPM, the comparison would show the true effect of the CPM on the state. While it isn’t possible to observe a California in which the CPM path was not taken, it is possible to create an estimate of this hypothetical California. This report therefore next employs the synthetic control statistical method to estimate how California would have performed had it not implemented the CPM. What is the Synthetic Control Method? 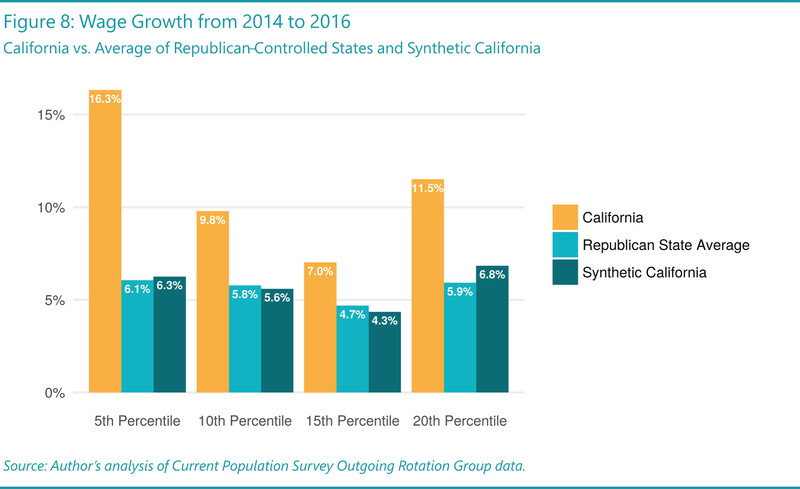 The synthetic control method is an increasingly popular technique used in policy evaluation.25 In this report, the method works by finding a combination of Republican-led states that can appropriately represent California without the CPM. Figure 6 illustrates how the synthetic control method works. The orange line shows California’s actual total employment relative to 2011. The blue line, labeled Synthetic California, shows the synthetic control method’s estimate of California’s total employment relative to 2011 had it not implemented the CPM. Prior to 2011, the lines mostly overlap—as they should—because the synthetic control method found the combination and weights of Republican-led states that most closely match California before the CPM. After 2011, when the CPM begins, the lines begin to diverge. Total employment in California is higher than the estimate for Synthetic California, indicating that total employment in California is higher than it would have been had the state not implemented the CPM. Figure 7 adds the results of the synthetic control analysis to the findings already reported in Figure 2 on employment and GDP growth from 2011 to 2016. 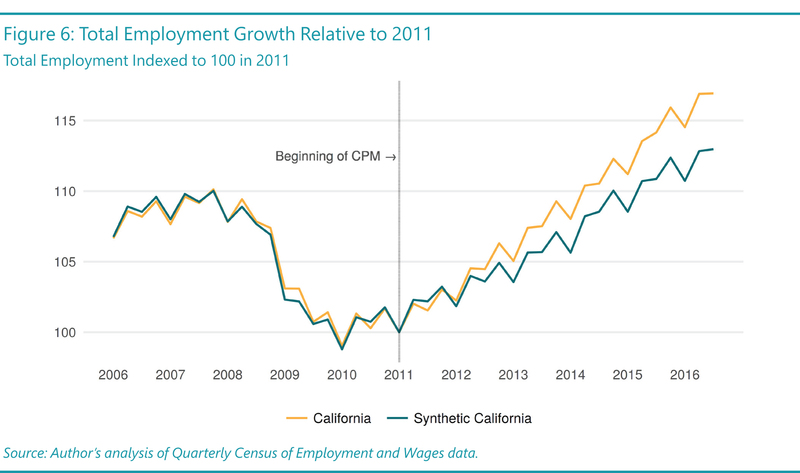 The synthetic control analysis supports the earlier finding that California had greater employment and GDP growth after implementing the CPM. California’s actual total employment growth from 2011 to 2016 of 16.9 percent is greater than the estimated growth in Synthetic California of 13 percent. Private-sector employment grew by 20.5 percent in California, compared to 13.3 percent for Synthetic California. California’s GDP growth, 17.2 percent, was greater than Synthetic California’s 10.9 percent. The synthetic control analysis also corroborates the earlier findings on the efficacy of minimum wage increases for promoting growth at the lower end of the wage spectrum, as illustrated in Figure 3. California’s 2014 and 2016 minimum wage increases would be expected to raise pay for workers up to the 20th percentile in the wage distribution, so the synthetic control analysis focuses on wage growth at the 5th, 10th, 15th, and 20th wage percentiles. 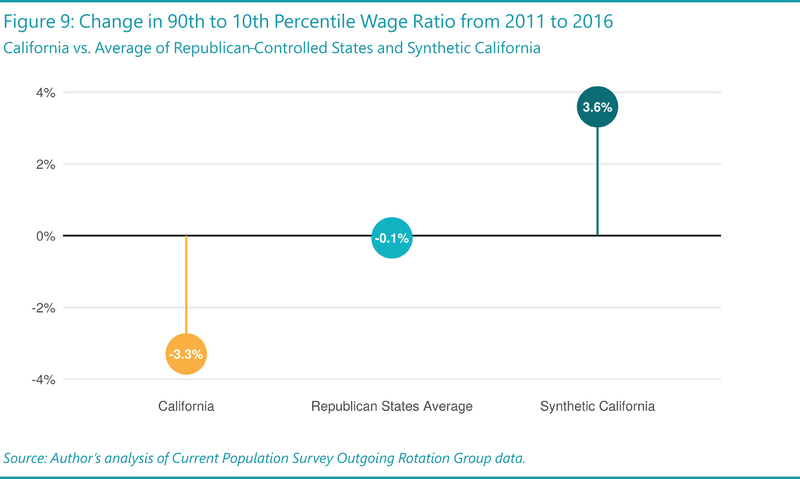 As seen in Figure 8, wage growth in California from 2014 to 2016 exceeded wage growth in Synthetic California at these lower percentiles. California’s 5th percentile wage grew by 16.3 percent, while the estimate for 5th percentile wage growth in Synthetic California was only 6.3 percent. 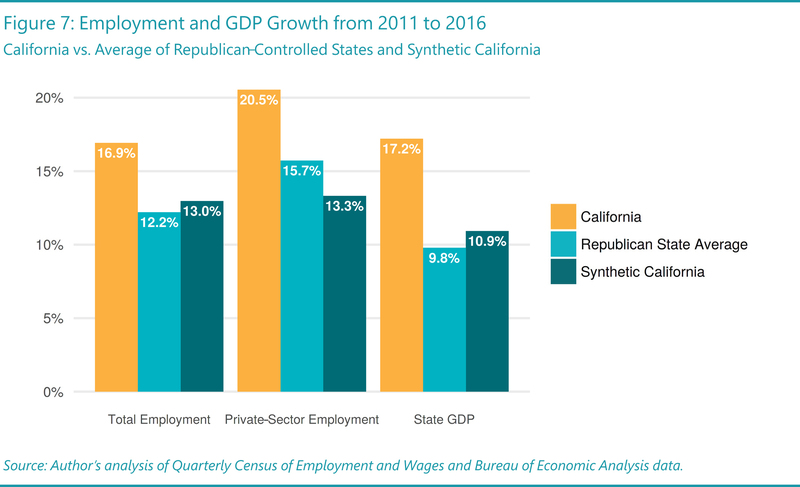 At the 20th percentile, wages grew by 11.5 percent from 2014 to 2016, but the estimate for Synthetic California was a much smaller growth rate of 6.8 percent. The synthetic control analysis also confirms California’s progress in reducing wage inequality. As Figure 9 shows, wage inequality as measured by the ratio of the 90th percentile wage to the 10th percentile wage fell by 3.3 percent from 2011 to 2016. On the other hand, the synthetic control analysis shows that without the CPM, wage inequality would actually have risen by 3.6 percent in California over the same period. 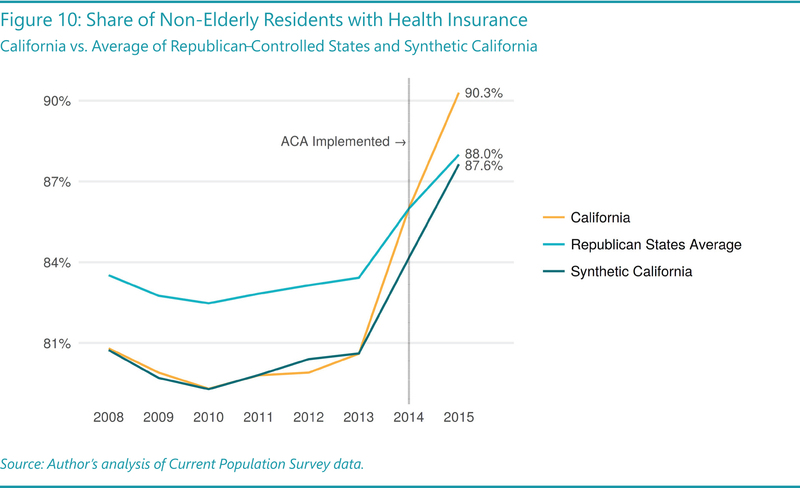 The synthetic control analysis also supports the earlier finding that California’s implementation of the ACA boosted the share of its residents with health insurance. 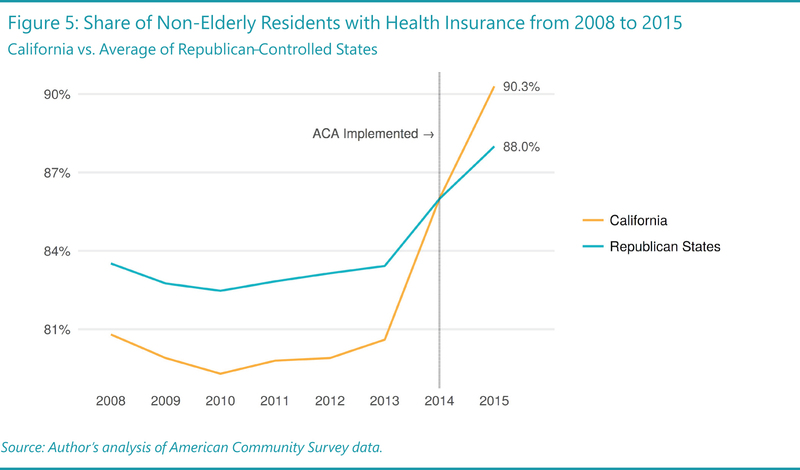 As Figure 10 shows, by 2015 California had a higher share of residents under age 65 with health insurance (90.3 percent) than the estimate for Synthetic California (87.6 percent). The synthetic control analysis above supports the original findings that the CPM did not lead to slower employment or economic growth, and was successful in raising wages for low-wage workers, increasing the number of California residents with health insurance, and reducing wage inequality. There are, however, two important caveats to these conclusions. It is possible that due to events or other changes after 2011, Synthetic California fails to produce an accurate picture of California without the CPM. Specifically, California’s technology boom took off in the same period as when the CPM was implemented, and this simultaneity could result in the analysis incorrectly attributing effects caused by the technology boom to the CPM. Several additional analyses were therefore conducted to test for this possibility, with results suggesting that the synthetic control model was able to account for California’s technology boom. As with most statistical analyses, it is customary in synthetic control analyses to test the measured effects for statistical significance to be sure the results are not artifacts of random noise.29 Synthetic control analyses vary in their ability to establish effects as statistically significant, and in this analysis that ability partially depends on the size of the group of states used to create Synthetic California. The fact that there were only 19 Republican-controlled states that could be used to create Synthetic California hindered the ability to establish statistical significance in this study. Therefore, these results should not be considered conclusive, and further research is needed to confirm the findings. Nevertheless, all of the analyses in this report point in the same direction: no effect of the CPM on employment and economic growth, along with successful implementation of its policies. This consistency in findings provides some additional confidence in the broader takeaway: that the CPM appears to have achieved its goals without hurting California’s economy. Housing is another major issue that has been inadequately addressed in the CPM through 2016. Housing is very expensive in California, with average home prices two and a half times the national average and average rents 50 percent higher than national averages.33 A serious issue in its own right, the housing crisis also proves to be a negative force in other areas addressed by the CPM. Expensive housing eats up a significant portion of the pay increases included in the CPM. California commuters also travel 10 percent further to their jobs than the national average—moving farther and farther away from urban centers in search of an affordable home—which results in increased automobile emissions working directly against the state’s climate goals.34 The housing crisis makes it hard for California businesses to attract employees, limiting the growth of the state’s economy and thereby making housing an across-the-political-spectrum concern.35 California has recently made some progress in this area, passing 15 laws in 2017 that address the housing crisis.36 It is too early to predict how that legislation will affect housing in California, but it is clear that the state must continue to focus on this important issue. It is also important to note that while this report only covers policy actions through 2016, California continues to add to the CPM. In addition to the legislation focused on the housing crisis, California also passed new legislation in 2017 that builds on its progress expanding workers’ rights, protecting the environment, and investing in the state’s transportation infrastructure. Beginning in 2011, California implemented an ambitious policy agenda aimed at strengthening workers’ rights, improving the environment, enhancing its safety net, raising tax revenue, and fixing the state’s infrastructure. This policy agenda does not appear to have reduced job growth or slowed the economy, and the policies appear to have met their intended goals: raising the wages of low-wage workers, increasing the rate of health insurance coverage, decreasing wage inequality, and helping the state hit its 2020 climate change goals. There is still important work to be done, including more rigorous enforcement of these new laws and contending with the state’s longstanding and worsening housing crisis. More research is needed to solidify the findings of this study, but its results indicate that the state has been effective in pursuing policy goals under the CPM without causing negative side effects. This provides good reason to believe that government action can also have a positive effect on the remaining problems. 1. See Shapiro and Irons (2011) and Labonte (2010). 5. See Investor’s Business Daily (2017). 6. See Allegretto, Reich, and West (2014). 7. See UC Berkeley Labor Center (2017). 8. See Jacobs and Perry (2016). 9. See Dietz, Lucia, Kominski, and Jacobs (2016). 10. See Robinson, Lee, and Goldman (2015). 11. See Dietz, Lucia, Kominski, and Jacobs (2016). 12. See Lucia, Chen, Jacobs, and Pourat (2016). 13. See State of California Franchise Tax Board (2017). 14. See Montialoux and Rothstein (2015). 16. See California Legislative Analyst’s Office (2012a). 17. See California Legislative Analyst’s Office (2012b). 18. See California Legislative Analyst’s Office (2016). 20. During this period, several California cities passed local minimum wage increases that set their minimum wage higher than the state’s. 22. Only five Republican-controlled states participated in the Medicaid expansion, and only two did so starting at the beginning of 2014 like California. 23. Author’s analysis of American Community Survey data. 24. See Greenblatt (2015), Hsia-Kiung and Morehouse (2015), and Next 10 (2017). 25. See Robbins, Saunders, and Kilmer (2015). 26. Additional detail on the synthetic control method can be found in the companion working paper (Perry 2017). 27. Additional detail on these analyses can be found in the companion working paper (Perry 2017). 28. Additional detail on these analyses can be found in the companion working paper (Perry 2017). 29. See Abadie, Diamond, and Hainmueller (2010) and Dube and Zipperer (2015). 30. See Eastern Research Group (2014) and Koonse, Dietz, and Bernhardt (2015). 31. See Cooper and Kroeger (2017). Ian Perry, MPP, is a research and policy associate at the UC Berkeley Center for Labor Research and Education. I would like to thank Ken Jacobs, Annette Bernhardt, and Jenifer MacGillvary for their assistance with this report. I would also like to thank Sylvia Allegretto, Michael Reich, Sara Hinkley, Hilary Hoynes, and Alex Gelber for their valuable comments. Any errors in the report are mine alone. Perry, Ian. California is Working: The Effects of California’s Public Policy on Jobs and the Economy Since 2011. Center for Labor Research and Education, University of California, Berkeley. November 2017. http://laborcenter.berkeley.edu/california-is-working/. Is Advanced Automation Disrupting the Livelihoods of Black Workers?